Hi-Tech Mold & Engineering Inc. produces injection molds for the automotive, heavy-duty vehicle and consumer product industries. During the economic crisis, this Rochester Hills, Mich., company decided to bring large mold-making work that had previously been outsourced back in-house. The company sought an injection mold machining solution that would produce large, complex molds in just one setup. Hi-Tech also hoped to improve its mold-making operation by obtaining additional speed, accuracy, repeatability and productivity. The company purchased a Makino MCC2516-VG horizontal machining center because of its proven experience with nearly 12 other Makino machines already on its shop floor. As Hi-Tech replaces its older models with new equipment, it enjoys the benefits of gaining more floor space and minimizing additional steps, ultimately shortening cycle times for injection mold machining. 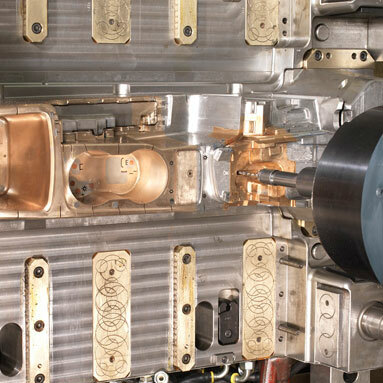 By machining with a 3+2 axis technique, the MCC2516-VG works well on large injection mold applications that require difficult techniques. The rigid spindle supports both short cutting for fine finishes, or completing extremely deep pockets at exact tolerances. The MCC2516-VG brings precise positioning and accuracy to parts with complex geometries. Fine detail, shutoffs and finishes—no matter where on the axis—are completed with excellent results, and the company is pleased to be producing a variety of these features unattended. In fact, injection mold machining time has been reduced by 20 percent. Using this new equipment, Hi-Tech can completely machine a part in just one operation with little to no handwork. Having the ability to combine steps and finish all parts in-house has enabled Hi-Tech to reduce its lead-times by 25 percent in many cases. High-Tech expects its return on investment to be complete in just a few short years, especially because the MCC2516-VG requires minimal maintenance, putting machine utilization at 90 percent.